In a congratulatory letter on behalf of the Council of Bishops of The United Methodist Church to President-elect Donald Trump, Bishop BruceOugh sent a prayer and a plea for the nation to come together. “I call to mind the best that is in us: we live under God; we are indivisible; and liberty and justice extend to all,” said Ough. Gathered at St. Simons Island last week for their fall meeting, the bishops signed a Bible that will be presented to President-elect Trump following his inauguration in a tradition that dates back to the very first president of the United States when Bishop Francis Asbury presented a Bible to George Washington in 1789. The tradition has continued with each subsequent president. On behalf of the Council of Bishops of The United Methodist Church, I offer congratulations to you, Mr. Trump, upon your election as the 45th president of the United States. Further, I thank Secretary Hillary Clinton for the gracious way she has accepted the voters’ decision. The Council’s prayers are for you, your wife, Melania, and your family, and for Secretary Clinton, her husband, Bill, and their family, after such a tightly contested presidential race. We are a deeply divided nation in a world community marred by division, war and unprecedented forced migration. This is a time for all Americans, particularly our political leaders, to put aside divisiveness and rancor and come together for the common good of this nation and the world. Thus, we pray for the healing of the nations and for God to grant you wisdom, compassion, moral conviction, courage and protection in your presidential leadership. The Council of Bishops pledges to contribute to all efforts to build bridges to understanding that will lead to overcoming the gulfs that divide the nation and the world. I call to mind the best that is in us: we live under God; we are indivisible; and liberty and justice extend to all. In 1789, Methodist Bishop Francis Asbury presented President George Washington with a Bible. 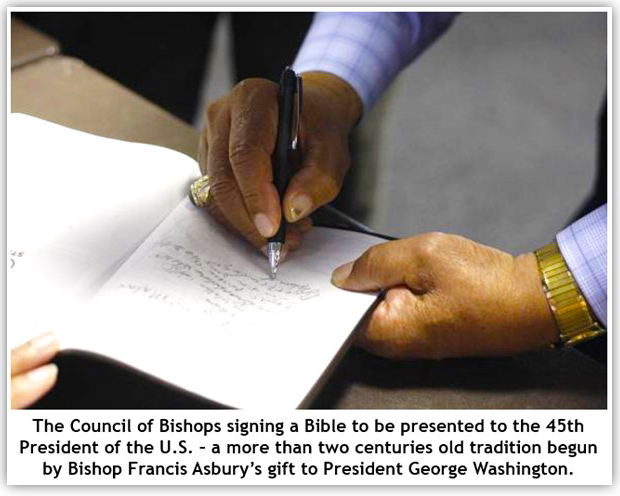 The United Methodist Church has maintained this 225-plus-years tradition of giving a Bible signed by the bishops to each subsequent U.S. president. The Council of Bishops is composed of 68 active and 97 retired bishops overseeing The United Methodist Church’s 12.3 million members in the United States, Africa, Europe, and the Philippines. Mr. Trump, I look forward to an opportunity, following your inauguration, to present a Bible to you. Give us wisdom to walk in your ways. That your power and might transcend the plans of every nation. Teach us again to do justice, love mercy and walk humbly with God.